Kia Rio: Spunky, “tossable” little car with poor mileage. Fun, with good handling, but needs help in stereo, noise, brakes, and acceleration. Dodge Neon: sporty, quirky vents, good size for price, needs work in high-speed engine noise and mileage. The Kia Rio is the cheapest car you can buy in America, but it does not feel like the cheapest. Its handling and price both put the similarly-sized Toyota Corolla to shame. Its tight steering and snarly exhaust make it sound like a muscle car, but a muscle car never handled this well. The warranty is far better than any American car we know of, or, for that matter, most of the Japanese cars. To be fair, major drawbacks are pokey acceleration – not bad by 1980s standards, but poor by today’s standards – and undersized brakes. We tested, appropriately, the version with the five-speed manual transmission of each car. This is less expensive than the automatic, and makes much better use of the small but efficient engines. At highway speeds, both the Neon and Rio are loud, because the five-speed transmission is geared for maximum acceleration at highway speeds. This also results in disappointing gas mileage for both cars. The larger Neon, ironically, is more economical. It is also quieter, though the Rio’s exhaust is tuned better. Indeed, the Rio’s exhaust sounds very sporty, and adds to the experience. We don’t know if we’d like it that much on longer trips. The Rio’s shifter is not terribly precise, but it is easy to get used to, and the clutch makes smooth shifts a piece of cake. The Neon’s shifter feels better, but the Rio’s clutch is easier to handle. Handling in both cars is confident and capable. The Neon’s handling is very, very good, but so is the Rio’s. Neither makes it easy to make the tires squeal. The Rio tends to understeer in sudden maneuvers, but it stays controllable. On the other hand, the Neon has a substantial edge in ride – it is much softer and does not transmit road imperfections into the cabin. The Neon’s interior is far larger than the Rio, and comes with two full size rear seats. Amenities are also in abundance on the Neon, and while the Rio has the necessities (rudimentary cupholders, side de-misters, day/night mirror), it does not have many of the “standard options” of the Neon. Trunk space on the Rio is, if anything, better than the Neon, though. Apparently, the Rio was aimed at drivers with more luggage than passengers. Though Canadians now get a five year, sixty thousand kilometer warranty on their Neons, Americans still have a three year, thirty-six thousand mile plan. Kia has followed owner Hyundai’s new five year-sixty thousand mile plan in the U.S., and has an optional ten year, one hundred thousand mile powertrain plan. Both are designed to bolster confidence in the Korean cars’ reliability. 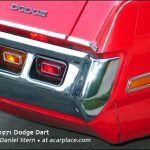 Chrysler should do the same with the Neon – most Americans do not consider Dodges to be well made. The Rio’s stereo is disappointing, given the rest of the car. Don’t bother ordering an optional stereo, just tear out the base factory setup and put in your own. One clever facet of the Rio is the hood, which includes the grille and part of the fenders (think Ram), providing unusually good access to the engine bay. Overall, the Neon is a more finished car with much more space, a quieter interior, and better ride, but the Rio starts at about $4,000 less. If money is tight, the Rio is a very nice package that outclasses its Korean rivals, and easily outhandles the Corolla. The Rio’s greatest shortcomings – noise and a tight squeeze in the back seat – are not important to many people compared with the price and warranty. On the other hand, if you feel you may need to pack in four people on a long trip (or even five people on a short trip), or want more amenities, the Neon is a better deal. We were impressed by the Kia Rio. It’s a bargain, but it doesn’t drive like one.